Caster was named Sportswoman of the Year for the third consecutive time - making her the undisputed golden girl of the NWU. The 26-year old from Polokwane won her third 800 m world championship in August when she ran a time of 1:55.16 during the IAAF World Championships in London. Caster – a two-time Olympic gold medalist – now equals the achievement of the legendary Mozambican 800 m runner, Maria Mutola, who also holds three World Championship gold medals. Joining her as Sportsman of the Year is middle-distance runner Rantso Mokopane, as well as cricket star Wihan Lubbe. The Junior Sportswoman is netball ace Monique Reyneke, while hammer thrower Carel Haasbroek was named Junior Sportsman of the Year. The night also served as an emotional farewell to James Stoffberg who served as director of sport from 2005 to 2017. The Rugby Institute on the campus in Potchefstroom also celebrated their year-end function by naming Walt Steenkamp as Player of the Year. The 2.02 m behemoth of a lock has been a stalwart of the Varsity Cup team for three years. During this time he also represented the Leopards’ senior team. The man known as ‘Warrior’ is only 22-years old and a long, fruitful career beckons. Loftus Morrison, who has played the most ever Varsity Cup games for the NWU, was named Forward of the Year and Player’s Player of the Year, while Chriswill September bagged the Piet Malan award for Backline Player of the Year. Burger van der Westhuizen was named Coach of the Year. 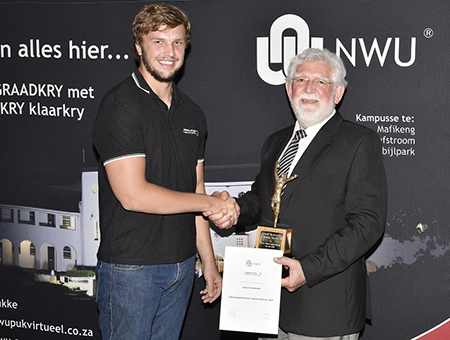 Walt Steenkamp of the Rugby Institute on the NWU’s campus in Potchefstroom was named Player of the Year. Here Prof Fika Janse van Rensburg, deputy vice-chancellor of the campus, congratulates him.